Directed by alumnus Jonathan Butterell and starring fellow graduates Mina Anwar and Luke Bayer, Sheffield Crucible’s production of Everybody’s Talking About Jamie has walked away with the UK Theatre Award for Best Musical. The show, which tells the story of a teenage boy who aspires to be a drag queen, will be transferring to London’s Apollo Theatre in November and both Mina and Luke remain in the cast. 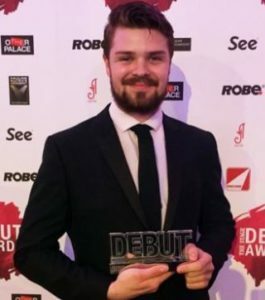 In other awards news, at the inaugural Stage Debut Awards Mountview graduate Samuel Thomas was among the winners, taking home the Best Actor in a Musical gong. Despite stiff competition, Samuel came away with the award for his performance in Allegro at the Southwark Playhouse. Speaking to the BBC after the ceremony, he had this to say: “The other lads nominated in my category were all worthy of this, but obviously I feel absolute pride, excitement and honour.” Huge congratulations to Samuel, Mina, Luke and Jonathan.